The album was released to high critical acclaim, with many critics calling it Stevens' best. Carrie & Lowell was widely deemed one of the best albums of 2015. The songs on the album were recorded in 2014 at Stevens' office in Dumbo, Brooklyn and Pat Dillett's studio in Midtown Manhattan. Some of the songs were also recorded in Oregon, at Portland's Flora Recording & Playback and on an iPhone in a Klamath Falls hotel room. A few songs were also tracked in Oklahoma, at Norman's Blackwatch Studios, and in Wisconsin, at Eau Claire's April Base Studios. The songs were inspired by the 2012 death of his mother, Carrie, and the family trips they took to Oregon in Stevens' childhood. Stevens' mother, who suffered from depression, schizophrenia, and substance abuse, abandoned him when he was a year old. According to Stevens, recording the album helped him come to terms with her death and provide closure. The album title also references his stepfather, Lowell, who helped co-found Stevens' record company Asthmatic Kitty. Carrie & Lowell debuted at number ten on the Billboard 200 with 53,000 equivalent album units; it sold 51,000 copies in its first week, with the remainder of its unit count reflecting the album's streaming activity and track sales. The album also debuted at number 10 on the Canadian Albums Chart with sales of 4,400. As of July 2015, Carrie & Lowell has sold 105,000 copies in the United States, with 44,900 of its total having been sold in the vinyl configuration. As of June 2017 it was certified silver by British Phonographic Industry for 60,000 sold units in UK. Carrie & Lowell received critical acclaim upon its release. At Metacritic, which assigns a normalized rating out of 100 to reviews from music critics, the album has received an average score of 90, indicating "universal acclaim", based on 40 reviews. Andrew Hannah of The 405 proclaimed that "Carrie & Lowell is just the latest in a long line of unimpeachable achievements." In his review for Pitchfork, writer Brandon Stosuy wrote, "Sufjan Stevens' new album, Carrie & Lowell, is his best." Stephen Carlick of Exclaim! called the record "a quietly triumphant return for Stevens, announced not by fireworks but by a series of small, elegant moments that reach for the heart." UK retailer HMV named it the best album of 2015. Laura Veirs – backing vocals on "Should Have Known Better"
Carrie & Lowell Live is a live album and concert film released on April 28, 2017 through Asthmatic Kitty. It was recorded live at North Charleston Performing Arts Center, South Carolina on November 9, 2015 during the Carrie & Lowell Tour. The performance was filmed and produced by We Are Films and features many new interpretations, re-workings, and expansions of the songs from Carrie & Lowell. The full concert film was made available to stream for free on Vimeo and YouTube. The Greatest Gift (Sufjan Stevens album), a 2017 mixtape album by Stevens from sessions for this album. ^ a b c d Dombal, Ryan (February 16, 2015). "True Myth: A Conversation with Sufjan Stevens". Pitchfork. Retrieved March 27, 2015. ^ a b Grebey, James (April 1, 2015). "Review: Sufjan Stevens Sheds the Frills on the Deeply Personal 'Carrie & Lowell'". Spin. Retrieved December 15, 2015. ^ "Sufjan Stevens Carrie & Lowell". cokemachineglow.com. Retrieved 6 August 2016. ^ Modell, Josh (January 12, 2015). "Sufjan Stevens Announces New Album, out March 31". The A.V. Club. Retrieved March 27, 2015. ^ Stevens, Sufjan (March 22, 2015). "First Listen: Sufjan Stevens, Carrie & Lowell". NPR. Retrieved March 28, 2015. ^ Horn, Adam. "Sufjan Stevens Just Proved He's So Much More Than a Musician". Mic (media company). Retrieved April 2, 2015. ^ Frochtzwajg, Jonathan (June 2, 2015). "Sufjan Stevens' New Record Carrie & Lowell Is an Ode to Oregon (Interactive Map)". The Oregonian. ^ "Interviews: True Myth: A Conversation With Sufjan Stevens". Pitchfork. Retrieved 2016-02-16. ^ Eggers, Dave (2015-04-26). "Sufjan Stevens talks to Dave Eggers: 'I was recording songs as a means of grieving'". The Guardian. Retrieved 2016-05-09. ^ White, Emily (April 10, 2015). "Death Cab For Cutie Parks at No. 1 on Top Rock Albums". Billboard. Prometheus Global Media. Retrieved July 2, 2015. ^ Caulfield, Keith (April 8, 2015). "Wale Rules With Second No. 1 Album, 'Furious 7' Soundtrack Drives to No. 2". Billboard. Prometheus Global Media. Retrieved July 2, 2015. ^ Lynch, Joe (July 2, 2015). "Taylor Swift's '1989' Tops 2015 Vinyl Sales; See the Other 9 Best Sellers So Far". Billboard. Prometheus Global Media. Retrieved July 2, 2015. ^ McIntyre, Hugh (January 8, 2016). "Vinyl Sales Surged 30 Percent In 2015, Led By Adele And Taylor Swift". Forbes. Retrieved November 8, 2016. ^ "Carrie & Lowell by Sufjan Stevens reviews". AnyDecentMusic?. Retrieved May 29, 2018. ^ a b "Reviews for Carrie & Lowell by Sufjan Stevens". Metacritic. Retrieved March 31, 2015. ^ Deming, Mark. "Carrie & Lowell – Sufjan Stevens". AllMusic. Retrieved March 31, 2015. ^ Modell, Josh (March 31, 2015). "Sufjan Stevens quietly wrestles with death on the near-perfect Carrie & Lowell". The A.V. Club. Retrieved December 15, 2015. ^ Brown, Helen (March 28, 2015). "CD reviews: Carrie & Lowell, Sufjan Stevens, review: 'hushed heartbreak'". The Daily Telegraph. Retrieved May 6, 2015. ^ Biedenharn, Isabella (April 3, 2015). "Carrie & Lowell by Sufjan Stevens: EW review". Entertainment Weekly. Retrieved December 14, 2015. ^ Hann, Michael (March 26, 2015). "Sufjan Stevens: Carrie & Lowell review – a delight in every way, and an album of the year". The Guardian. Retrieved March 27, 2015. ^ Gill, Andy (March 27, 2015). "Sufjan Stevens, Carrie & Lowell – album review: Stirring memories from the troubled troubadour". The Independent. Archived from the original on March 29, 2015. Retrieved March 27, 2015. ^ Beaumont, Mark (March 27, 2015). "Sufjan Stevens – 'Carrie & Lowell'". NME. Archived from the original on December 21, 2015. Retrieved December 10, 2015. ^ Stosuy, Brandon (March 30, 2015). "Sufjan Stevens: Carrie & Lowell". Pitchfork. Retrieved March 30, 2015. ^ Mapes, Jillian (March 31, 2015). "Carrie & Lowell". Rolling Stone. Retrieved June 13, 2015. ^ Hannah, Andrew (March 16, 2015). "Sufjan Stevens – Carrie & Lowell". The 405. Retrieved April 16, 2015. ^ Carlick, Stephen (March 27, 2015). "Sufjan Stevens – Carrie & Lowell". Exclaim!. Retrieved April 20, 2015. ^ "the best albums of 2015". Retrieved September 13, 2018. ^ "The 100 Best Albums of 2015". Musicaneto. December 25, 2015. Retrieved December 25, 2015. ^ "NME'S Albums of the Year 2015". NME. Time Inc. UK. Retrieved 2015-12-10. ^ "Sufjan Stevens – Carrie and Lowell". Alongside Your 78s. 2016-02-08. Retrieved 2017-12-12. ^ "The 50 Best Albums Of 2015". Stereogum. SpinMedia. 2015-12-01. Retrieved 2015-12-10. ^ "ALBUM VAN HET JAAR: SUFJAN STEVENS!". OOR. 2015-11-27. Retrieved 2015-12-28. ^ "Australiancharts.com – Sufjan Stevens – Carrie & Lowell". Hung Medien. Retrieved April 11, 2015. ^ "Austriancharts.at – Sufjan Stevens – Carrie & Lowell" (in German). Hung Medien. Retrieved April 12, 2015. ^ "Ultratop.be – Sufjan Stevens – Carrie & Lowell" (in Dutch). Hung Medien. Retrieved April 12, 2015. ^ "Ultratop.be – Sufjan Stevens – Carrie & Lowell" (in French). Hung Medien. Retrieved April 12, 2015. ^ "Dutchcharts.nl – Sufjan Stevens – Carrie & Lowell" (in Dutch). Hung Medien. Retrieved April 6, 2015. ^ "Sufjan Stevens: Carrie & Lowell" (in Finnish). Musiikkituottajat – IFPI Finland. Retrieved March 27, 2018. ^ "Lescharts.com – Sufjan Stevens – Carrie & Lowell". Hung Medien. Retrieved April 12, 2015. ^ "Officialcharts.de – Sufjan Stevens – Carrie & Lowell". GfK Entertainment Charts. Retrieved April 12, 2015. ^ "Charts.org.nz – Sufjan Stevens – Carrie & Lowell". Hung Medien. Retrieved April 10, 2015. ^ "Norwegiancharts.com – Sufjan Stevens – Carrie & Lowell". Hung Medien. Retrieved April 11, 2015. 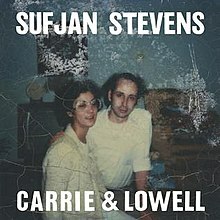 ^ "Portuguesecharts.com – Sufjan Stevens – Carrie & Lowell". Hung Medien. Retrieved March 27, 2018. ^ "Spanishcharts.com – Sufjan Stevens – Carrie & Lowell". Hung Medien. Retrieved April 12, 2015. ^ "Swedishcharts.com – Sufjan Stevens – Carrie & Lowell". Hung Medien. Retrieved April 11, 2015. ^ "Swisscharts.com – Sufjan Stevens – Carrie & Lowell". Hung Medien. Retrieved April 12, 2015. ^ "Sufjan Stevens | Artist | Official Charts". UK Albums Chart. Retrieved April 6, 2015. ^ "Sufjan Stevens Chart History (Billboard 200)". Billboard. Retrieved April 9, 2015. ^ "Jaaroverzichten – Album 2015" (in Dutch). dutchcharts.nl. Hung Medien. Retrieved 26 December 2015. ^ "British album certifications – Sufjan Stevens – Carrie & Lowell". British Phonographic Industry. Retrieved 29 October 2018. Select albums in the Format field. Select Silver in the Certification field. Type Carrie & Lowell in the "Search BPI Awards" field and then press Enter.